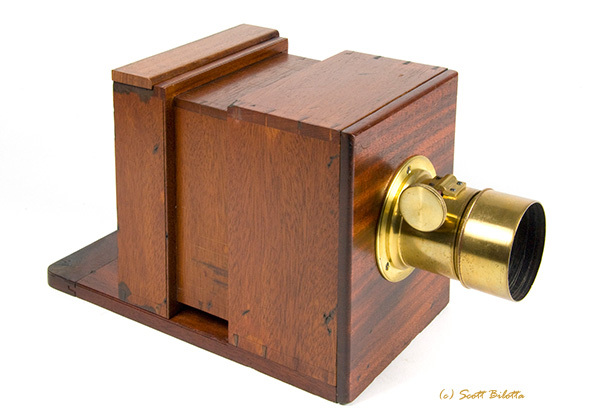 This petite mahogany sliding box camera is probably of English origin and dates to the early- to mid-1850s. The identity of the maker is unknown. 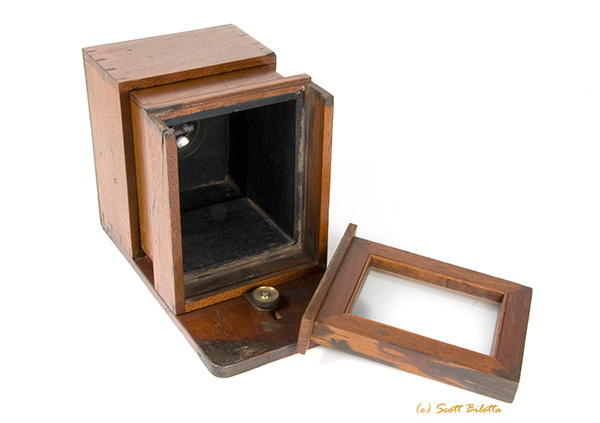 The sliding box form of camera was the earliest style, commercially introduced in 1839 along with the first photographic process, daguerreotypy. When this camera was made photography was only about fifteen years old. It took photographs measuring approximately 3 by 4 inches, a size commonly known as quarter-plate. Quarter-plate cameras were the smallest practical size in common use during the wet-plate and daguerreian era. The camera's overall dimensions are 9 1/2 x 5 1/4 x 6 5/8 inches. I think that small wooden cameras have a unique charm. The camera consists of two wooden boxes, one sliding within the other. The outer box is attached to a baseboard. Focusing is accomplished by sliding the inner box until the scene appears sharp on the rear ground glass screen. There is a round brass nut at the back that serves to lock the boxes into position. Fine focus is adjusted with the lens rack and pinion. Because the screen image is dim a photographer would normally compose and focus the photograph while working under a dark cloth. The procedure of taking a photograph is as follows: After composing and focusing, the photographer places a cap over the lens, removes the ground glass panel and inserts a plate holder in its place. In the plate holder there is a cover called a dark slide that protects the photographic plate from extraneous light. The dark slide is removable or retractable, and it is withdrawn prior to making the exposure. The exposure begins when the photographer removes the lens cap. After the required number of seconds have elapsed the lens cap is placed back over the lens. Finally the dark slide is replaced and the holder removed and taken to a dark room or tent to process the plate. The plate may have been either a glass plate coated with a wet collodion emulsion, or if a daguerreotype was being made, a silver-plated copper plate. Wet-plate photography dates from 1851 and was practiced for about thirty years. This photographic process was messy. The photographer was required to sensitize a glass plate with chemicals in the dark, insert the dripping wet plate into a holder, place the holder into a camera, take the photograph and then return to the dark to develop the image - all while the plate was still wet. This was a cumbersome process that had to be performed at the scene. Notice the areas of dark wood at the rear of the camera. These are stains caused by the wet chemicals, in particular the silver salts. Chemical stains are a hallmark of wet-plate cameras and should never be removed. Refinishing an early camera is guaranteed to reduce its historical and monetary value. During the 1850s wet-plate and daguerreian photography were the two most common processes. The daguerreotype method was introduced in 1839 and practiced until ca. 1860. Wet-plate photography was superseded by the dry-plate method in the 1880s. It can't be said for sure whether this camera was originally made for daguerreian, wet-plate photography, or perhaps both. Either type of "film" could have been used, the determining factor being a slight difference in the way plates were held in the holders. Daguerreian cameras that were modified to accommodate wet plates are now called transitional cameras by photo historians. Actually the modification was made to the plate holders. No change to the camera was required. The only significant clue to the identity of the camera's maker is found on the lens. The brass-bound lens, bearing serial number 502, is engraved L. F. Colas Eleve de Lerebours Paris. Eleve translates to student in English. The lens has rack and pinion focusing and is not slotted for Waterhouse stops. I have located snippets of biographical information on L. F. Colas. According to the Museum of London's photoLondon database Colas' full name was Louis Ferdinand Colas. Colas was born in France in 1820 but lived in England from at least 1841 until his death in 1876. His occupations are listed as: paste-board box manufacturer during 1844-1848, photographer from1851, and stationery manufacturer from 1861. He is listed as being a photographer and living with F. A. Mouqué at 105 Cheapside, City of London in 1851, as having a photography studio at this address in partnership with Mouqué during 1851-1854, and solely operating a studio at this address during 1854-1859. Colas is listed as having been a pupil of the French daguerreotypist N. P. Lerebours. What Colas studied is not revealed. Was it lens making, daguerreotypy or possibly both? Noël Paymal Lerebours was an optician and manufacturer of lenses, cameras, optical and photographic equipment and supplies. The question that comes to mind is whether Colas manufactured the lenses that were engraved with his name or whether he was a retailer or perhaps a manufacturer of cameras? It was not uncommon for retailers to engrave their name on lenses they sold. 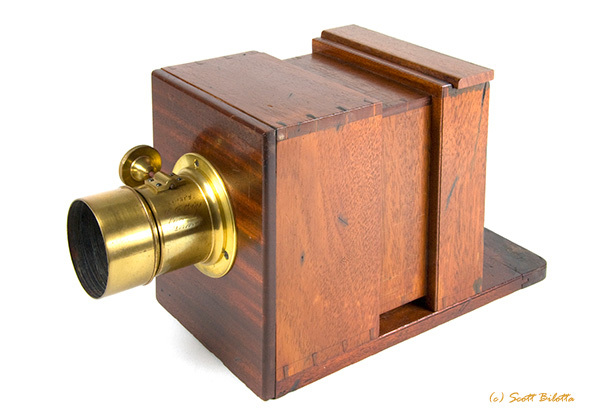 A typical camera of the period would consist of a box made by a firm or individual and a lens made by an optician. It was not typical that early camera makers were also lens makers. François Auguste Mouqué also had a variety of occupations. He is listed as being a daguerreotypist and fancy box maker who was living with Colas in 1851. One possible explanation for the camera's origin is Mouqué and/or Colas made camera boxes and mounted lenses purchased at wholesale. On the other hand, an advertisement for L. F. Colas lenses appeared in the August 21, 1857 edition of the English Journal of the Society of Arts. The advertisement says: "Portrait Lenses, which for depth of focus, fine definition, and giving a full field, are superior to any other in the market at the price, are made by L. F. COLAS, eleve de Lerebours, of Paris. The advertiser has sold a great number of these Lenses, especially of the whole-plate size, and has found that in all instances they have given the greatest satisfaction. Pairs of Lenses, of quarter-size, made expressly for stereoscopic work, always in stock. Sole Agent in England, Mr. ELISHA MANDER, 98, Snow-hill, Birmingham." 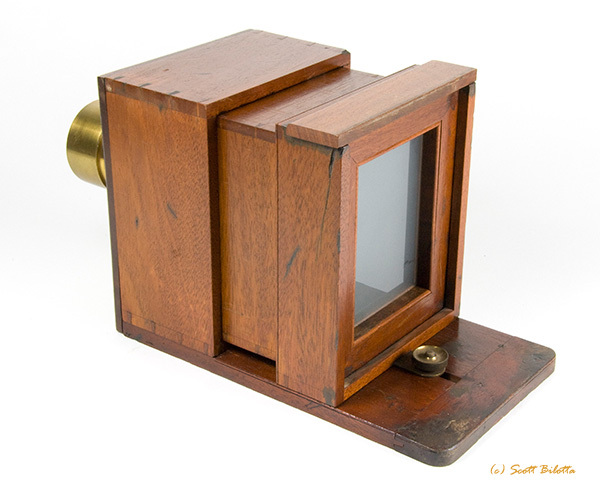 I know of two other sliding box cameras with L. F. Colas lenses that were offered at auctions. Part of the fun and frustration with collecting early cameras stems from the fact that there are so many where the identity of the maker is unknown. Such anonymity violates a fundamental tenet of modern-day marketing. Although I enjoy researching this question, it's OK with me that I may never know who made these cameras. I appreciate the craftsmanship that went into their making and the stories they reveal of times past.